You might believe some cultures give terrible directions, but maybe you’re just bad at receiving them. When travelers and businesspeople set out for trips abroad, they sometimes forget that carrying a map is just as important as knowing your hotel name! When you’re lost in a foreign land, even if you do have a map, the first thing many people do is ask the safest-looking person on the street, be it a street vendor or a mother with kids for directions. Often, one simple question will lead to a slew of locals offering different advice, routes, arguments in another language, or even a ride on someone’s motorbike. When you’ve done enough traveling, you realize that a country’s culture has a massive impact on the way they offer directions, and whether or not they give you the right directions to your destination. Let’s take a look at why. Believe it or not, a lot of how we give and understand directions has to do with our hometown’s layout. If you are from a major metropolis with a grid system, you’re more likely to give cardinal directions with street names and map-like phrases in mind. This seems pretty straightforward to many of us, but what about those of us who grew up in rural areas with just a couple of main roads? The cardinal directions might be confusing to someone who’s never had to consult a map or street sign. These individuals tend to favor landmarks (commonly referred to as a “referencia” in Spanish). Now think even further to areas of the world without any street signs whatsoever, and landmarks in the form of hole-in-the-wall eateries and unnamed convenience stores. Direction in these countries are even more confusing, and tourists often feel they’ve been led astray when trying to navigate the alleys and dirt roads. If you’re from a developed country, the third example won’t be nearly as easy to follow as the first two. In short, one of the reasons we give directions the way we do is based on how we see our surroundings, which is often based on where we grew up. Another huge factor in the way we give directions is based on cultural context. High-context cultures use fewer words, and more nonverbal clues, and are less likely to give direct or blunt instructions (They’re also less likely to say they don’t know where something is!). High-context cultures include those in Africa, the Middle East, Latin America, Greece, Southeast Asia, among others. You might have to judge the confidence of the speaker’s directions based on his or her body language, since many things are left unsaid in a high-context culture, letting the culture fill in the blanks. Low-context cultures are much more direct, and rely on accurate words to describe a situation. Eye contact and body language are much less important, because they are more likely to say directly whether they do or do not know where something is. Directions will be much more direct, and are likely to use more specific instructions, like street names, rather than guesstimates of time and distance. If you learn a little bit about the culture before you arrive, you’ll have a much easier time navigating directions given by a local. According to the article, what is just as important as knowing your hotel name? Carrying a map is just as important as knowing your hotel name. Based on context, what do you think cardinal directions are? Cardinal directions are directions given using the four points on a compass (north, east, south, west). Select all that apply: According to the article, what contributes to the way we give or understand directions? Fill in the blanks with the appropriate imperative forms of the verbs. To get to the train station, (to walk) (walk) straight on this road for about 2 minutes, then (to turn) (turn) left at the first stop light. (To cross) (cross) the street at the other end of the bridge and (continue) (continue) straight until you see the station on the right. If Jennie walks north one block and turns right, in what direction is she going? INTERMEDIATE: Look at this map, and write directions from the following places, using proper grammar. 1) The Airport to the Belleview Hotel 2) The Pet Shop to the Zoo. 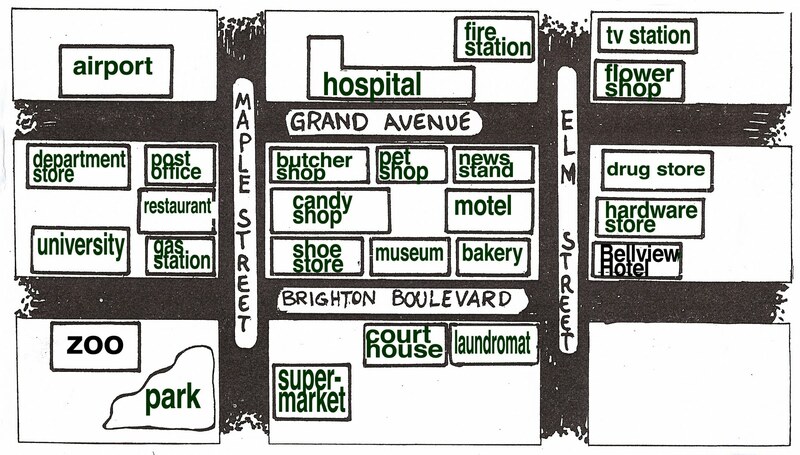 3) The Laundromat to the Fire Station to the Department Store. ADVANCED: Write a 100-word dialogue in which multiple people from different countries offer directions.